 Sol Lesser, a producer with a weakness for formula-grinding and also keen to repeat the financial success ofTarzan Triumphs, decided to quickly churn out another "Tarzan against the Nazis" film. The combination of director William Thiele and writer Carroll Young who had made Tarzan Triumphs a fast-paced action drama now managed to produced one of the weakest of Weissmuller's 12 Tarzan films. Jane was still off in England (Less was still praying that Miss O'Sullivan would change her mind about returning) and the female lead, a wisecracking carnival magician, was given to Nancy Kelly, an RKO contract player. 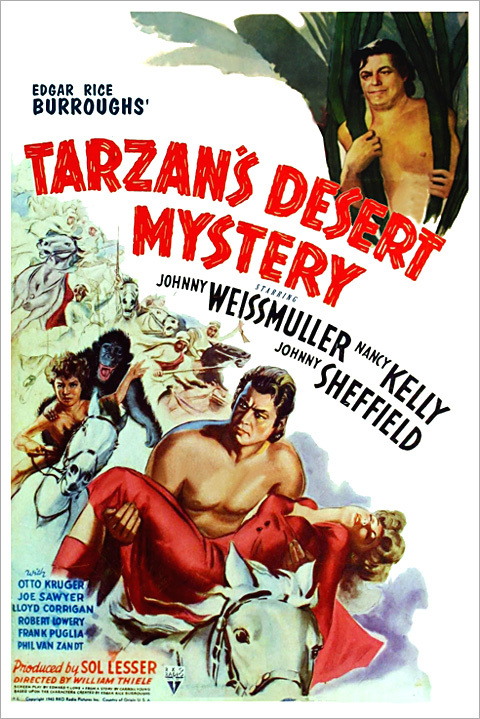 The film was weakened by having Tarzan absent from the screen (off in prison) for long periods. Weissmuller only has about 40 words of dialogue in the whole film and most of the story development happens around the character of Connie Bryce, the travelling magician. The last couple of reels, which have Tarzan encountering dinosaurs (rear projection lizards in close up) and fighting a very hokey man-eating plant, seem a lot like a completely different film. (Essoe, Fury & St Andrews) Read the full story at Geoff St Andrews Tarzan's Desert Mystery page.  Tarzan and Boy embark on a long journey across a vast desert to collect some fever medicine for Jane who is in England nursing troops. 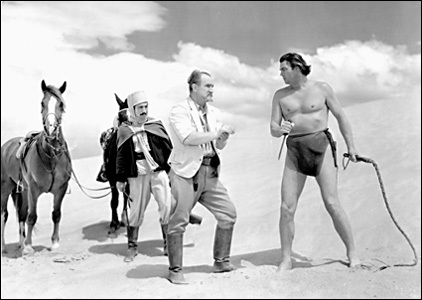 On route they clash with some cruel men that are mistreating a beautiful pinto stallion named Jana (above), and meet Connie, a fast-talking Vaudeville magician, who has been secretly enlisted by Sheik Emir of Alakibra to deliver a message hidden in a bracelet to his neighbour, Prince Selim, of Bir-Herari. Bir-Herari has fallen under the influence of a heartless profiteer named Paul Hendrix (real name Herr Heinrich) and the message Connie carries exposes Hendrix as as a spy. When Tarzan, Boy, Connie and Jana reach Bir-Herari Tarzan is jailed as a trouble maker, Connnie delivers her message to Prince Selim, who is immediately killed and Connie is framed for the murder. As Connie is about to be executed for murder Tarzan escapes on Jana and carries Boy and Connie out into the desert. Tarzan remembers his mission for Jane and goes to collect the serum but Hendrix chases Boy and Connie into a cave inhabited by a giant spider. Tarzan arrives in time to save Boy and Hendrix is killed by the spider. The Sheik of Bir-Herari honors Connie for delivering the message and Connie offers to deliver the fever medicine to Jane when she reaches England. Jana carries Tarzan and Boy back to their jungle home. • Both photos were donated by Geoff St Andrews. Thanks a million, Geoff!